AUSTIN – Well within the memory of many Texas Baby Boomers, some Hill Country schools used to give students a holiday on the first day of deer season. That doesn’t happen anymore, and there’s no reason to skip school since opening day now always falls on the first Saturday of November. But Texans still get excited with the approach of deer season, and for hundreds of thousands of hunters, this year Halloween night will be almost like Christmas Eve. The season for whitetail deer and turkey begins at 30 minutes before sunrise Saturday in both the North and South zones. It continues through Jan. 4, 2015 in the 209 counties in the North Zone and until January 18 in the 30-county South Zone. A late antlerless and spike season will run from Jan. 5-18 in the North Zone and Jan. 19-Feb. 1 in the South Zone. There is also another youth only season from Jan. 5-18 in all counties where deer hunting is legal. 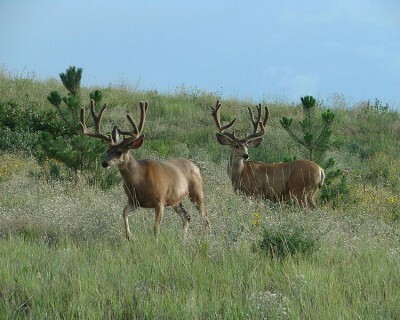 Bag limits and legal antler spread on bucks varies by county, so it’s best to consult a copy of the Texas Parks and Wildlife 2014-2015 Outdoor Annual or the new Outdoor Annual app for smartphones before heading to the field. The annual is available at hunting license sales outlets, online at www.tpwd.state.tx.us and as a free mobile app download on iOS and Android platforms at www.txoutdoorannual.com/app. One requirement that does not vary is that all deer and turkey taken must be tagged. And to do that, you must have a valid Texas hunting license. When hunting, you must also have a valid driver license or state-issued identification card in your possession. Legal hunting time for the day ends 30 minutes after sunset. Since sunrise and sunset times vary by geographic area, be sure and check what those times will be where you’ll be hunting. Texas game wardens will be out in force this weekend to make sure that those who head to the field hoping to harvest some fresh meat and maybe a good set of antlers not only obey all applicable laws but also get home safely.